During the Spanish Civil War on the 26th of April 1937 the German Air Force (Luftwaffe) bombed a small town of Guernica in Spain killing hundreds of innocent people. Pablo Picasso who was one of the most influential artists of the twentieth century plagued by this horrific action expressed his disgust on a canvas which later became a masterpiece known as Guernica. The mural Guernica represents suffering people, animals, and buildings wrenched by Nazi bombing and later earned the title Tortured Guernica. According to an eye witness’s account which appeared in The New York Times on April 28, 1937 describes the heartbreaking events that occurred at the small Spanish town. The report follows thus. At 2 a.m. to-day when I visited the town the whole of it was a horrible sight, flaming from end to end. The reflection of the flames could be seen in the clouds of smoke above the mountains from 10 miles away. Throughout the night houses were falling until the streets became long heaps of red impenetrable debris. Many of the civilian survivors took the long trek from Guernica to Bilbao in antique solid-wheeled Basque farm carts drawn by oxen. Carts piled high with such household possessions as could be saved from the conflagration clogged the roads all night. Other survivors were evacuated in Government lorries, but many were forced to remain round the burning town lying on mattresses or looking for lost relatives and children, while units of the fire brigades and the Basque motorized police under the personal direction of the Minister of the Interior, Señor Monzon, and his wife continued rescue work till dawn. The indiscriminate killing of a large numbers of the Guernica civilians by the Luftwaffe Junkers aroused Pablo Picasso's artistic conscious. Small Spanish town of Guernica was not a militarily significant target. But in front of an immense military power a sense of justice and value of human lives became trivial. 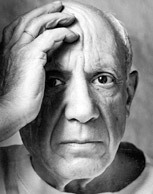 Picasso who was a genius of shape molded his artistic ability to send a message to the evil dowers as well as to the future generations who would learn by Guernica tragedy. Pablo Picasso's monumental painting The Tortured Guernica portrays an eternal anti war symbol. Although Picasso was a well-known artist but least understood so as his mural Guernica which carries artistic expressions of an enigmatic gesture. It is a black and grey picture without text which silently spoke thousand words. The picture contains images of a light bulb, a bull's head, a dying horse, a woman with outstretched arms, burning buildings, a warrior with a broken sword and an anguished mother with a dead child. Each image has a deep meaning and symbolizes the death, evil power, human despair and anguish. The content of Guernica was widely discussed by the Artistic community as well as Psychologists. Although the precise significance of the imagery in Guernica remains ambiguous Guernica challenges the 20th century notions of warfare and portrays it as a brutal act of violence and urge for self-destruction. 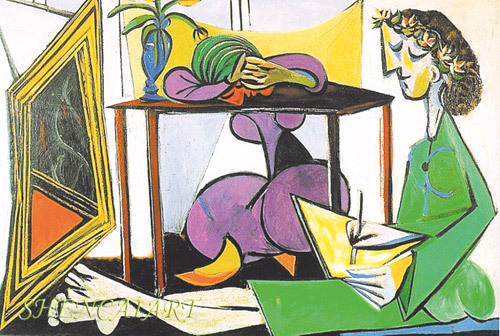 Picasso seized the instinctive id impulses which comprise the unorganized part of the human personality structure that contains the basic drives. As the psychoanalytic notion the Id is the dark, inaccessible part of human personality or the savage part which becomes active in events like war. Sigmund Freud believed that the id represents biological instinctual impulses in men such as aggression (Thanotes or the Death instinct) and sexuality. Thanotes or the Death instinct is the foremost subject of the mural Guernica. Picasso’s Guernica painting narrates the rhythm of death and human suffering. It reflects the unexpected change from life to death. The image of bulb on the top represents the bombs fell from the German Junkers which brought the message of death. The symbolic painting of the horrors: the fallen hero and anguish mother with her dead son, agonized horse, and the dead with widely opened eyes recount an outsized story. It is a form of indictment of man's inhumanity to man. The Tortured Guernica is a testament to Picasso's genius. The Guernica's concealed images of death are a prophetic vision of the modern warfare. The painting is an artistic metaphor for the human anguish under a deadly unleashed force the mankind ever saw.